Several years ago Lady M. sent me a photograph of a picture. There is no signature attached, no indication of the name of the place on the picture… Nothing. Just the suppositions. The palace looks much like the palace of Finckenstein… Or the non existing anymore palace of Friedrichstein in Kreis Wehlau (now in Russia). As far as I remember – Lady M. bought the painting in a little antique shop in former Leningrad few years after WW 2. The man who sold it to her, was supposedly a war veteran and he insisted that this was one of many palaces in East Prussia. So, knowing I am a Prussian, lady M. sent this to me, hoping I would be able to find out where the depicted palace could be found. One thing we both did not take into consideration – that there are very few palaces left after the Red Army marched through here on their way to Berlin in 1945. Hoping to find the palace – I went through quite a collection of paintings by Alexander Duncker. He painted Prussian palaces and castles. I finally found a picture (two in fact) od the palace of Friedrichstein. One – as seen from the garden and the second – as seen from the front driveway. But is it really this palace? 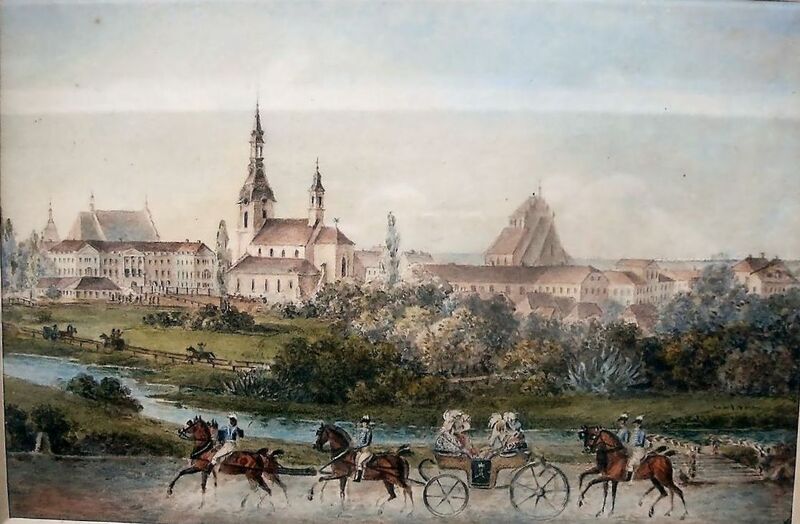 Was the depicted palace – really in East Prussia? Will this mystery ever be solved? Both the palaces (Finckenstein and Friedrichstein) are a bit similar, as they were designed by the same architect – John von Collas. They were built to bear the status of the royal palaces for the Prussian royalty en route. And therefore could not be modest in any way. The last known Doenhoff was Marion – who had luck enough to have fled on horseback before the Red Army entered Quitainen (where she lived till 1945). She wrote several books on East Prussia, and even though they are of poor quality as literature – they are a good source of information about the life then and there. The other palace mentined before – Finckenstein – had once belonged to the Finck von Finckenstein family, and then (through marriage) to the Zu Dohna-Schlobitten family. It was among the most beautiful Prussian palaces.